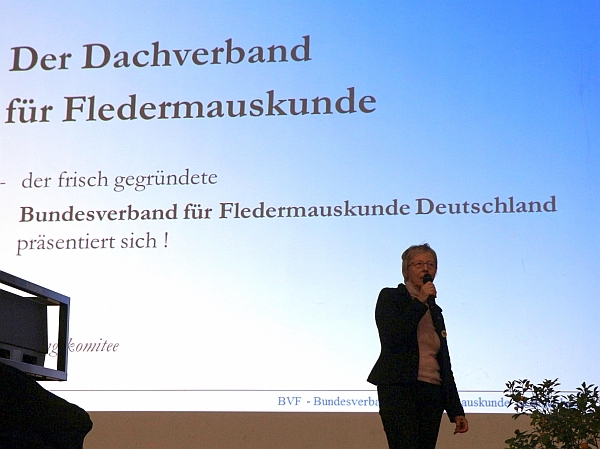 At the end of February 2015 the “Bundesverband für Fledermauskunde Deutschland (BVF)” (Federal association for bat science in Germany), the German umbrella organisation for bat workers and bat conservation was founded. This guided a lengthy discussion phase in the German bat community successfully to its objective. The foundation was carried out by nine German groups which are active in bat monitoring, research and conservation. Those founding groups are situated in six different German federal states, confirming the nationwide claim of the BVF. At this starting point, the BVF already represents about 800 bat workers in Germany. Bats are key species in conservation, research and mitigation all over Europe. A large number of volunteers, public authorities and consultants work on those topics. But in large countries that are furthermore organised in different federal states – such as Germany – a huge variety of methods grew over the last decades and today often lead to results that are not directly comparable. The main goal that led to the BFV’s foundation was a comprehensive and neutral representation of the German bat workers’ interests. The BVF also aims to build a nationwide network for bat workers, establish accepted standards for their work and concentrate competence as well as experience to fulfil European directives in the protection of bats and their habitats. To achieve these goals support and active involvement of all German bat workers is essential in order to create a strong community that represents all bat related topics. The BVF is also looking forward to cooperate with other organisations on an international level to promote collective goals in bat monitoring, research and bat conservation.